Description: It is a small slow growing cactus obtained by crossing ♀ Ariocarpus retusus x ♂ Ariocarpus fissuratus. The superb features of this rare plant are due to the intersection between the traits of the ancestors. 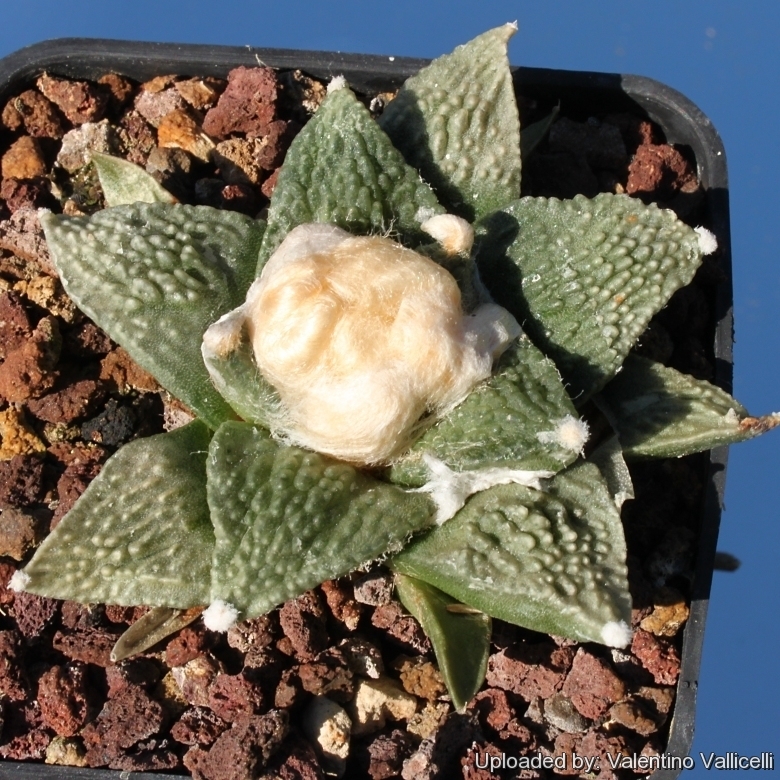 It has inherited by Ariocarpus retusus the triangular tubercles and by Ariocarpus fissuratus the papillate, fissured surface. The flower are also very beautiful. This hybrid is very variable and differences among specimens may be considerable. Stem: Subglobose, flattened on top, 3-6 cm high, rising barely above ground level, that grows extremely slowly, to 10-15 (or more) cm in diameter. The stem is usually solitary, rarely giving rise to side shoots from old areoles. Tubercles: Greenish-brown, greyish-green, yellowish-green or olive-green, triangular in outline, acute at the apexes, deltate in cross section, flattened adaxially, or becoming slightly concave at maturity, irregularly papillose sometime forming one or two lateral furrows, usually as long as wide. (to 3-4 cm long), and with the edges acute. Areoles: Apical or sub-apical, rounded, 1-5 mm in diameter on adaxial tubercle faces, rounded to more or less elliptic or linear, 2-5 mm diameter, woolly. Flowers: These plants have a woolly crown, from which emerge bright pink-violet flowers up to 5 cm in diameter, 2 times wider than long when fully expanded. Flowers last for 3 to 4 days.